The inspiration came from a short story by Frederik Brown which relates how an illusionist in Cincinnati turns into the Satan because one prayer wheel in Tibet ceases to turn. Another inspiration was the idea of Telegarden, a most interesting online project, where those participating can nurse real plants via the Internet. If you can water flowers online, why can't you turn praying wheels? Of course, an idea in itself is just an idea - you need a praying wheel, Internet, devices that move the wheel and a place where it is moving. I've been playing with the idea for years, when I told about it to an acquaintance. This is how I got to the Dharma Gate Buddhist College, where after a short negotiation I was given the praying wheel of the college. So I had a praying wheel - there was no way back. 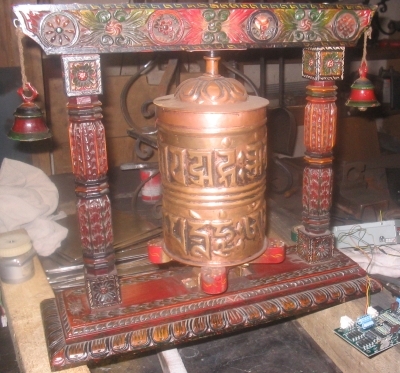 The praying wheel consists of a beautiful carved wooden frame and a copper cylinder. And when I turn it, it turns. Its maker, however, didn't mean it to be turned by an engine. So it needed some restructuring. Fortunately, a friend of mine and an expert on assembling, joined the project. He considered the task for a while, then took a discarded automated teller machine (he stored it in his garage thinking that it could be of some service sometime). So we got the parts we needed. My father restructured and assembled the mechanical parts (shaft, bearings) of the wheel. Of course, this was not enough. You need to be able to click somewhere. The programming work related to the webpage was directed by a colleague of mine and was done by our company. So we had a wheel and it was turning well - now we needed a place where it can be seen by as many people as possible. Finally, we decided to get into contact with the House of Future in Millenaris Park (Budapest, Hungary), and they were happy to join the project. The consecrated praying wheel was donated by the Dharma Gate Buddhist Church and College.